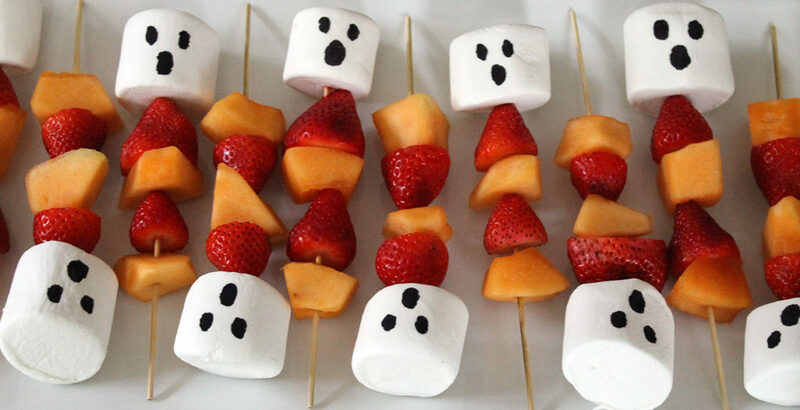 Halloween is just a week away, and we are getting ready for all the Halloween festivities at our house! 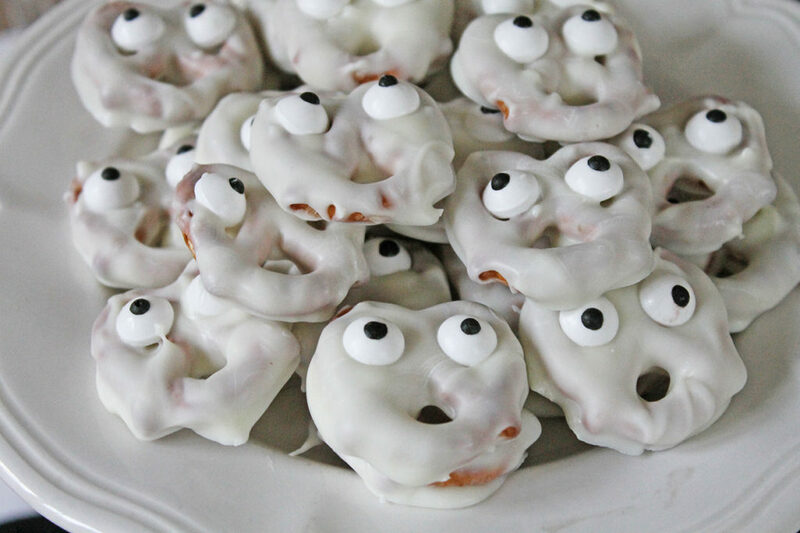 One of those activities has become a tradition…our annual Halloween lunch. 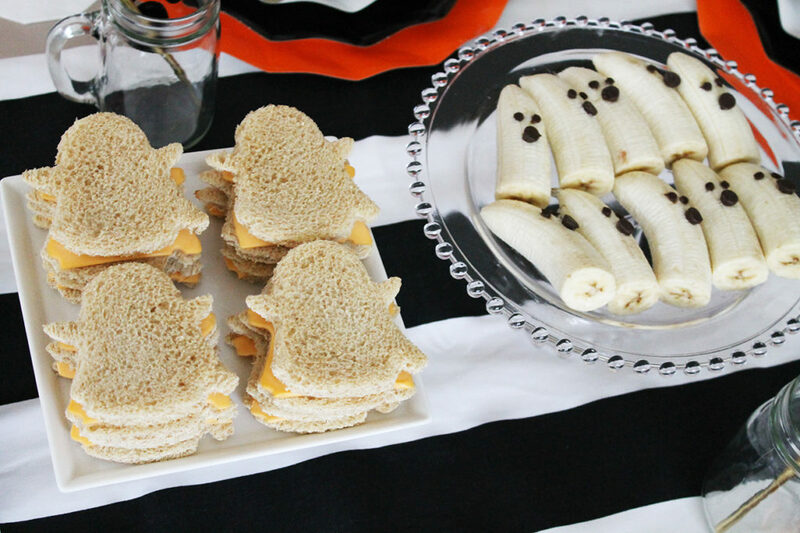 My daughter’s school dismisses for an extended lunch on the day of the Halloween parade and party, to allow them time to change into their costumes. For the past several years, we’ve hosted a few friends for lunch on that day. 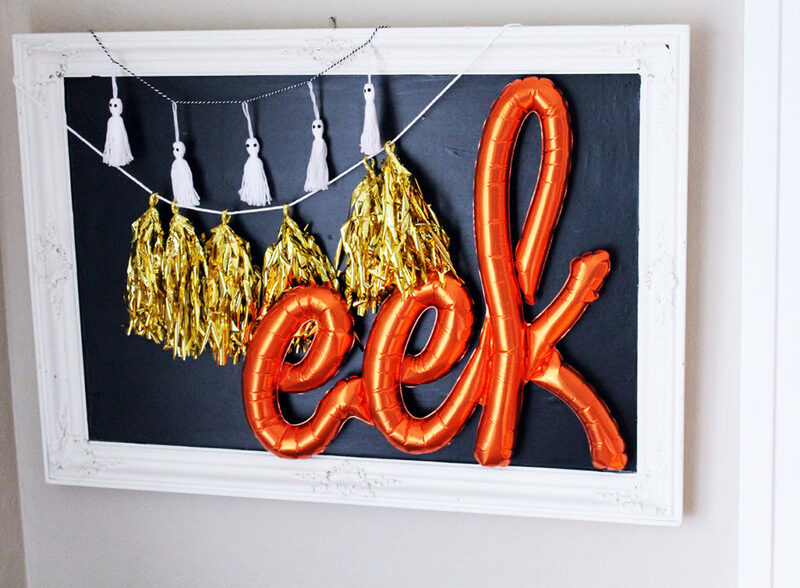 Of course, we always think of black and orange as typical Halloween colors. 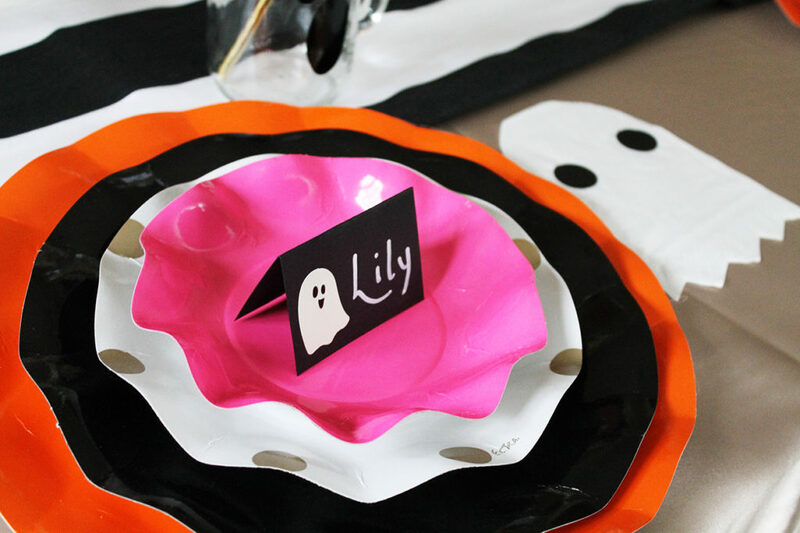 I threw in a fun dose of bright pink for some whimsy, along with black, white, metallic gold and orange. 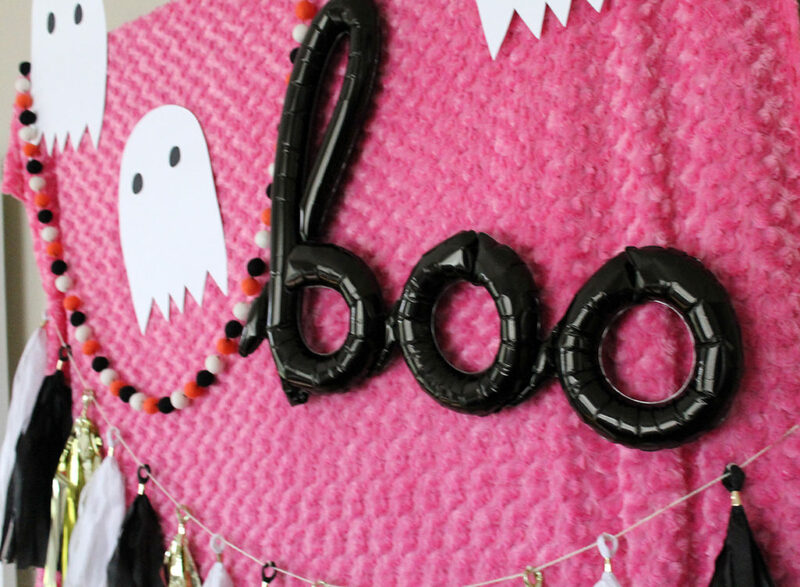 For the “boo” display, I covered my china hutch with a large piece of bright pink fabric. 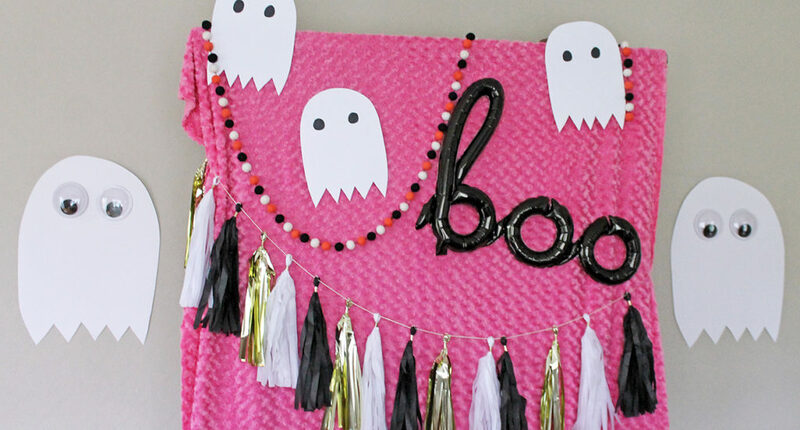 Then I decorated it with tassel and pompom garlands, the black boo balloon and some ghosts that I created using white posterboard and large wiggle eyes. 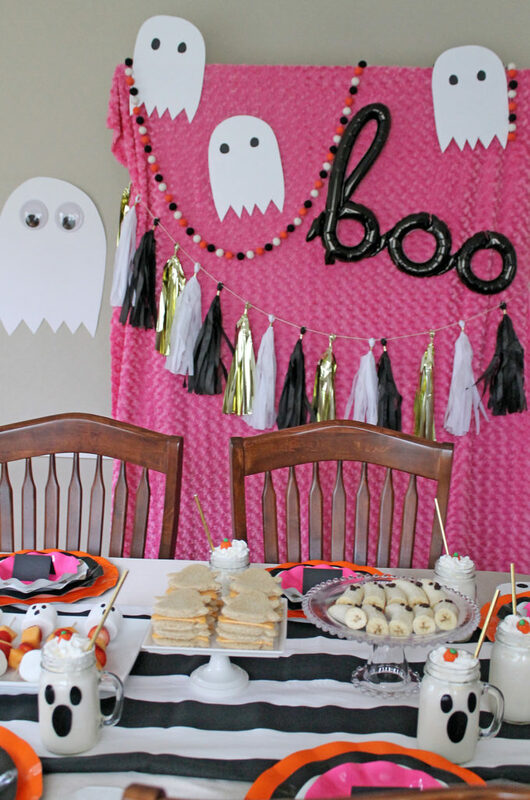 It made for a fun backdrop to the lunch! 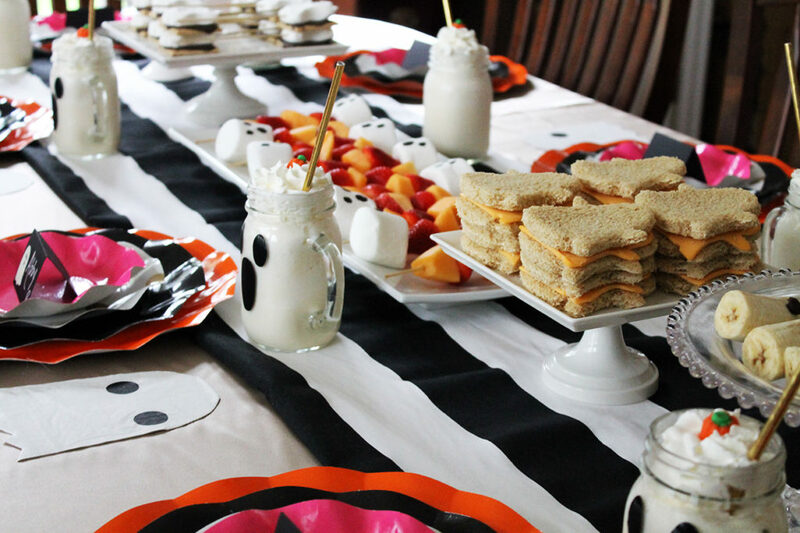 I covered the table with my black and white striped tablecloth (which I have used for so many occasions…it really was a great investment). 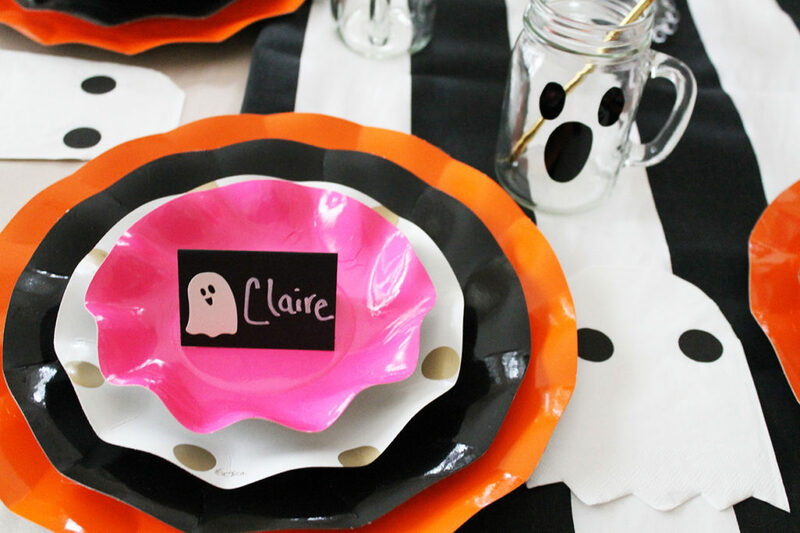 I layered the ruffled plates for a fun tablescape. 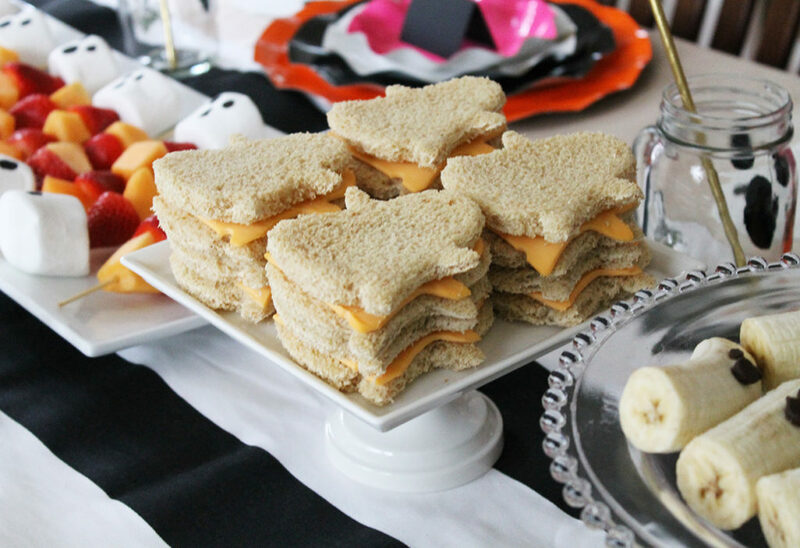 The ghost napkins were really what sparked the idea for this themed lunch in the first place…aren’t they adorable? 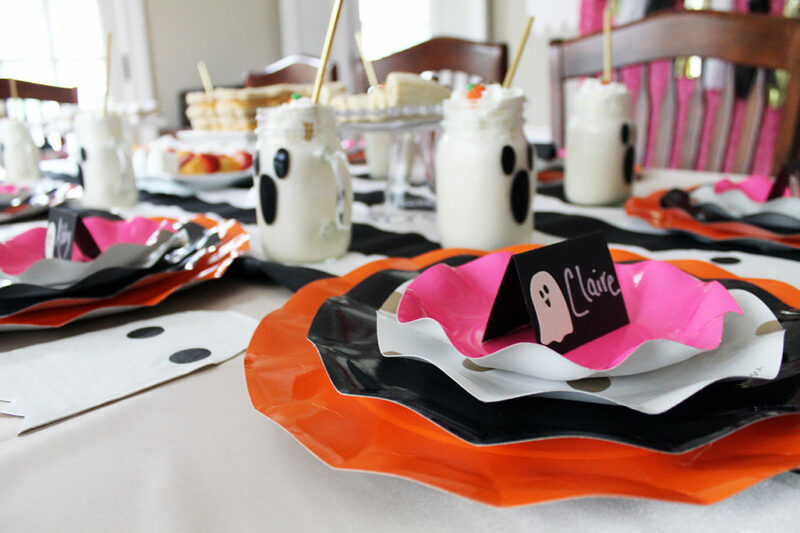 I also decorated my mason jar glasses with black vinyl to create ghost faces. 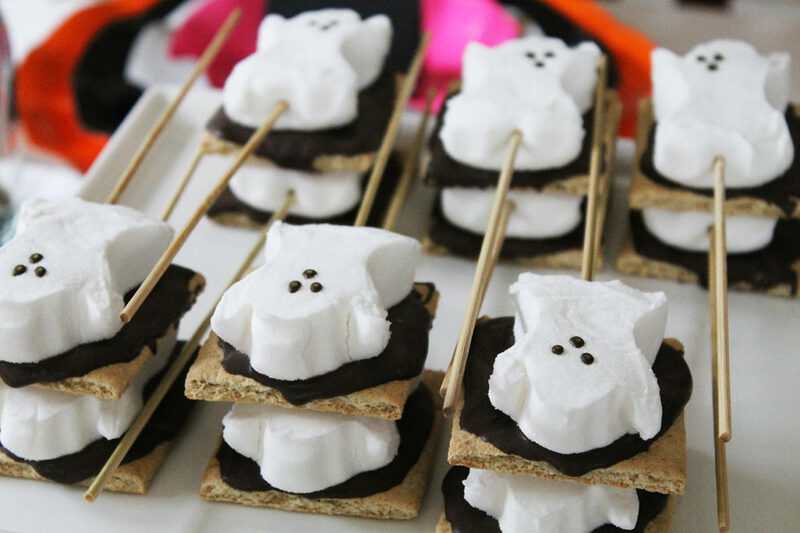 As far as the food, I continued with the ghost theme…ghost cutout cheese sandwiches, banana ghosts, fruit kabobs with ghost marshmallow toppers, white chocolate covered ghost pretzels and ghost marshmallow s’mores on a stick. 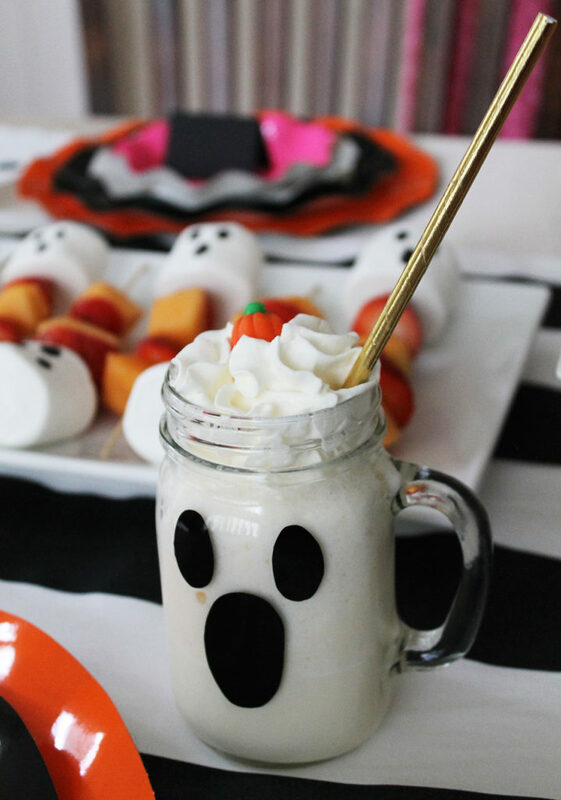 Vanilla milkshakes made for perfect ghost drinks!